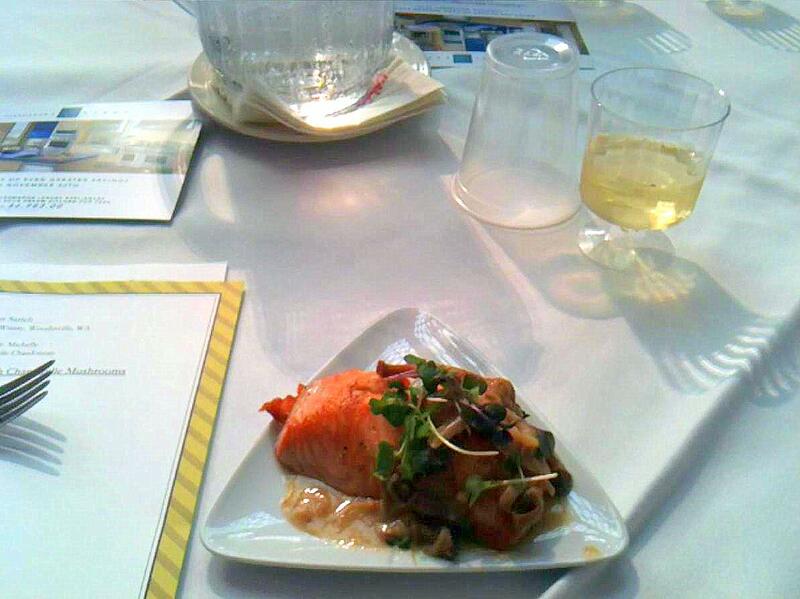 I had a chance to try a culinary demonstration and a wine tasting on opening night of Epcot’s 2010 Food and Wine Festival, and came away very impressed at both what I learned and the value for the money. If you’re headed to Epcot during Food and Wine, I recommend booking one of these events. The first event was a culinary demonstration hosted by a Chateau Ste. Michelle, a Washington state winery. Soon after we were seated, Ste. Michelle brought out a nice-sized sample of one of their chardonnay wines. Ste. Michelle’s Bob Surrency gave some background on the winery and the wine itself, then told us to sample the wine before the food was prepared, to get a sense for how the wine tasted on its own. At the same time, Ste. Michelle’s Culinary Director John Sarich prepared a tasty grilled salmon filet with shiitake mushrooms, in a light cream sauce. When that was done, Bob asked us to sip the wine, take a bite of the salmon, and then try the wine again. Since the only thing I know about wine is that it involves grapes and (sometimes) the French, this was a revelation. The wine’s flavors change quite a bit when paired with food. John and Bob explained how this happens and what to look for when pairing different wines with different flavors. They also provided tips on how to choose a wine when a recipe calls for one, as opposed to a wine that’s served with a meal. This first demonstration ran about fifty minutes, but I get the sense that John and Bob were having enough fun that they gladly would have gone longer. The cost was around $9 per person, $6 if you’re an annual passholder. The second event was a culinary demonstration, coincidentally with the same folks from Chateau Ste. Michelle. During the second event we tasted the Ste. Michelle riesling, merlot and cabernet. Bob and John spent about fifteen minutes discussing how each wine is produced, its characteristics, and suitable food pairings. In the case of the riesling, John made a point of saying that it could stand on its own, without food. (I brought a bottle to a party this weekend to try this out, and it seems to be true.) Again, I got the feeling that they could have spent more than an hour talking about these three bottles. Before going to these events, I thought they were targeted to people who already knew a lot about wine. I think now, however, that complete novices will find them really helpful as an introduction into either a specific wine, or a set of wines. And while I’m a little hesitant to tell Disney, I think the $9 cost for an hour of food, wine and entertainment is a remarkable bargain. Sounds like this was a great event. We went last year to a bourbon tasting hosted by Jim Beam. The samples alone provided far better value than any comparable alcohol we could have purchased in the park, and the seminar was both informative and engaging–the perfect level of “edutainment” for Epcot. Next time we head down for Food & Wine Festival, we’re definitely attending more of these for the same reasons you identify. Glad to hear you enjoyed the experience, Len! We’ve been enjoying these events since 2005 F&W. Very informative for both of us. Rob (hubbie) is very well-informed about wines and I just follow his lead. We both get something from the experience. This year we are attending a signature dinner event at Portobello Italian Trattoria at Downtown Disney Area, with guest chef, Chicago’s Tony Mantuano. We also managed to schedule a Tequila tasting in Mexico. Can’t wait. We’ll be there in two weeks. So I might come off sounding like a complete wine-snob, but I promise, that’s not my intention! We live in the Finger Lake region of NY, one of the US’s top wine producing areas and live about 45 minutes from the New York Wine and Culinary Center, so we go to classes fairly often. Last year we went to the Moet & Chandon Champagne Seminar during Food & Wine at Epcot and while we enjoyed it, didn’t feel like we got too much out of it because we already knew a lot from our local place. I expected more about the winery and not about how they make Champagne. So all of that said, I encourage people who don’t know a lot about wine to go to the seminars, they are presented on a beginner’s level and there’s nothing to be shy about! This year we decided to up our game and went to Party for the Senses instead of doing seminars. A totally equal trade off, right? Agreed that these events are a lot of fun and easy on the pocketbook. Interestingly, many of the “food celebrities” featured in more expensive events at the festival (signature dinners, sweet sundays, etc.) also do the cheaper deminars, so if seeing your idol is important but your budget is small, check these out. I second this. Also, I picked up two bottles of the Ste. Michelle wines this weekend. They can be had for under $15 or $20 each, some under $10. I forgot to check what the markup was at Epcot. The Ste. Michelle cab was $35 at the festival, but I didn’t catch the price on the merlot or chardonnay. I’m linking this webpage from my private weblog . this has all the usefull data necessary.